Life as a geisha is often busy with organizing events, and as usual, this week I am busy with organizing banquets for the week ahead. Banquets are the main thing that geisha do, but it seems customers are often not really sure what a banquet involves. So what is a banquet? The average banquet is a leisurely two hour dinner at a traditional Japanese tea-house. Cuisine is usually fresh seasonal ingredients, with a lot of fish, but there are some wonderful vegetarian options, and meat can be prepared on request. Tea-houses are usually exquisite traditional buildings often with little gardens, and every corner of the tea-house is beautiful. Customers usually arrive first and order drinks, and then the geisha make their entrance all together. 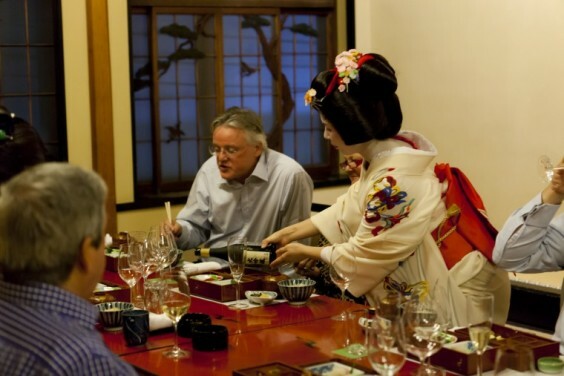 The price for a banquet depends on the ratio of customers to geisha. One customer and ten geisha would be very expensive indeed, but ten customers and one geisha would be very affordable. Usually it would be best to have at least a minimum of one geisha for every five or so guests. I always ask my customers to tell me their numbers and the maximum budget they want to pay per person and I give them some options within their budget. I try not to turn anyone away. Sometimes there are ways to make banquets work even for smaller budgets. Halfway through the meal the geisha do a performance, usually around half an hour long, with a variety of instruments: shamisen and singing, drum, and flute, and the geisha dance. The music is always different to match the season. And then if the customers would like to, we play traditional drinking games. The banquet I am organizing now is an overseas client who comes to Japan every year for his birthday with different friends and family each time. I still need to get a birthday present, and organize a birthday cake. And I have arranged tickets for him for the annual geisha dances in one of Kyoto’s geisha districts, a lovely opportunity to enjoy a geisha performance on the big stage. I often say that coming to a banquet is to experience the best of Japanese architecture in the beautiful tea-houses, the best of Japanese cuisine, and sake, the best of Japanese painting in the art on the walls, and pottery, and flower arrangement in the decorations. One can see the loveliness of the geisha kimonos, and the artisanship in our accessories. And experience Japanese music, and of course, dance. There is really nowhere else that one can get such a total Japanese cultural experience at one time in one place. Now with internet, one can find banquets advertised, but some caution is needed. 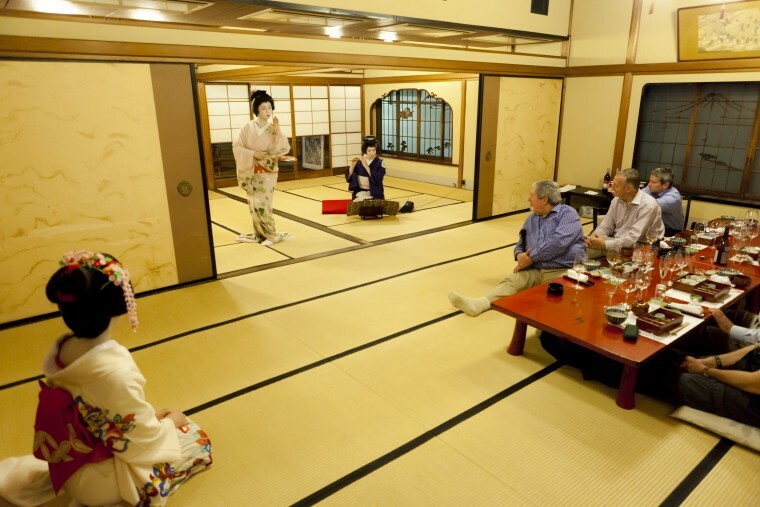 Much of what is advertised are not real banquets…geisha prices don’t alter so how do they do it? 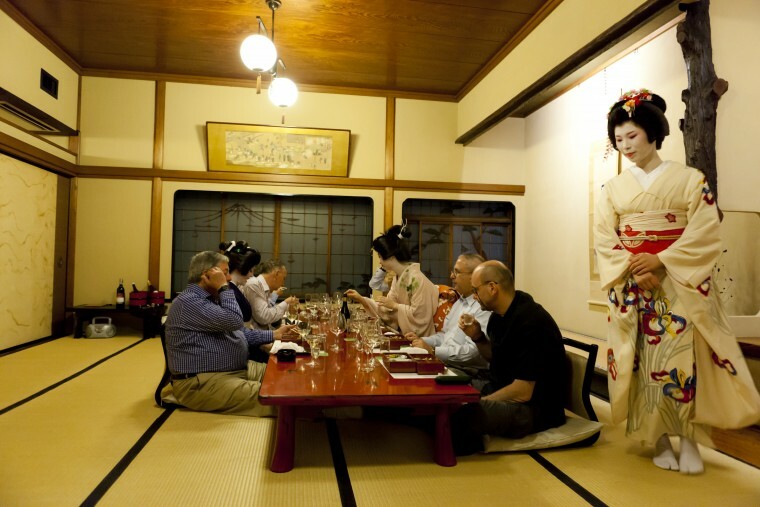 Sometimes restaurants hire one maiko to go around every room in the restaurant spending only 10 or 15 minutes in each room. Other times customers are all together, 30 or 40 of them, in one large room. There is even one company advertising as geisha girls who have never trained as geisha at all! But the internet has made other things easier. Traditionally first-timers were not welcome at tea-houses. But now if foreign customers book with me online I become the introducer and the tea-houses will accept even first-timers.